Mik wanted to make sure he saw the U.S. Marine Corps Memorial/Iwo Jima Memorial while we were in DC, since on the first day he bought a miniature of it for his miniature collection and we also got the National Park Passport stamp for it at Arlington National Cemetery. Since after the MLK Jr Memorial we were closest to the Arlington National Cemetery Metro stop, which was one of the closest to the Memorial, we just decided to walk to it. 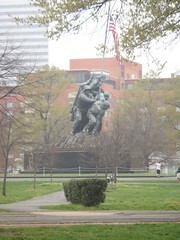 We then just walked back to our hotel, which was near Rosslyn, the other stop near the memorial. The walk was not bad, but it is hilly with a rather steep part as you approach the Netherlands Carillon before you get to the Iwo Jima Memorial when coming from Arlington National Cemetery. The route between the Rosslyn Metro and the Memorial seems shorter and not as steep overall. The Netherlands Carillon is not all that interesting to look at, but it does have interesting lion statues in front of it. It would have been nice to hear it ring on the hour, but we were there right between the hours at 12:30 p.m. exactly and it was too cold and wet (just sprinkling) for Mik. However, there were some great patches of tulips in bloom nearby. Mik really loved seeing the tulips with his favorite being the orange ones. 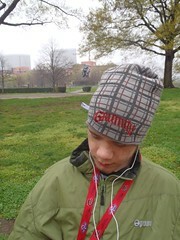 Mik was ready to be back at the hotel by the time we got to the Iwo Jima Memorial. I did not insist we cross over to actually go up close to it because I have seen it before and understood he was cold and wanted to be indoors. 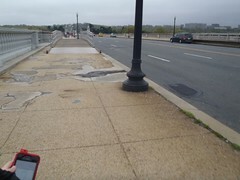 So we just took a picture from the path across the street and continued on to Rosslyn. 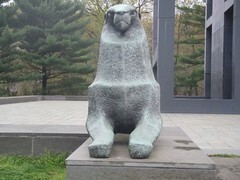 Note: Both memorials are part of the George Washington Memorial Parkway National Park Unit.